Alongside his full load of teaching and InterArts MFA advising, Mat Rappaport works across in multiple platforms and media to explore the socio-political implications of mass tourism and ideology. Earlier this fall he presented a video installation focusing on the Prora, Germany workers’ tourist resort that was instigated by the Nazi regime in an effort to strengthen sympathies between the workers and the Nazi party after the breaking of the workers’ unions. 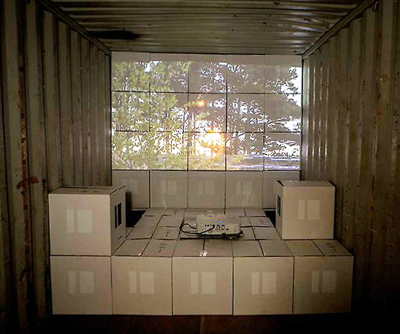 Rappaport’s work, Touristic Intents, was part of Contained, the inaugural Gateway Arts Festival/A Requiem Project Exhibition this past October in Cincinnati, OH. Contained featured outdoor, site-specific glimpses into the contemporary conversation of photography and a unique look into lens-based fine art. 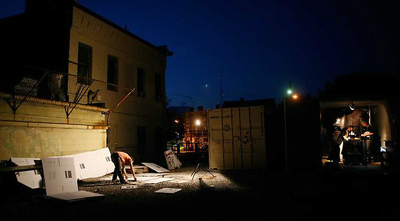 Participating created photographic experiences within the boundaries of 11 large steel shipping containers. Rappaport’s touristic intents was comprised of a video installation containing fragments of documentary footage, audio and animated photographs, centered on a case study; the never completed Nazi Resort in Prora, Germany. The mammoth site was intended to house 20,000 vacationing working-class Germans, but was never completed by the Nazis. Later, the Socialist East German government completed the construction and used it as a military training site that also included a small officers resort. Currently the building is being redeveloped with a youth hostel, and there are plans for apartments, condominiums, and hotels. For more information on this ongoing project, and other explorations and work by Mat Rappaport, click here.